Fifteen-year-old Felton Reinstein has always been on the smallish side, but in his sophomore year he starts growing...and growing. During gym one day he smokes the football jocks in a 600-yard race. Felton has never been interested in sports, but there's no doubt-he is "stupid fast." As he juggles his newfound athletic prowess, his mom's sudden depression, an annoying little brother, and his first love, he discovers a shocking secret about his past which explains why he's turning out the way he is. Okay first off, before anything else, a shout out to whoever wrote the synopsis for this book! THANK YOU for giving us just enough to be drawn in, and not spoiling anything big. I'm kind of frustrated with the way that book jackets pretty much tell you the plot lately. On to the review! In my quest for more books from the male perspective, I stumbled upon Stupid Fast. I was really drawn in by the description, and so I signed up for the tour so I could read devour it. You know what? Best decision I ever made! Geoff Herbach should know that his book is fantastic! It's hilarious, it's a realistic portrayal of a teenage boy, it's heartwarming, it's emotional, oh and did I mention it's also hilarious? Felton has one of the most original voices of any character that I've read this year. His character is funny, silly, sweet, adorable, and all kinds of awkward. Of course the most endearing thing about him is that this is all because he's struggling to grow up. See, Felton is pretty much the parent to his younger brother Andrew, since his mother is a fairly absent parent. The two of them bicker, much like all siblings do, but you can see the love that is there too. My favorite part about Felton though was his unabashed (and hilarious) view of the world around him. The way he phrases things had me laughing out loud! I'm glad I read this book at home, and not on the bus! 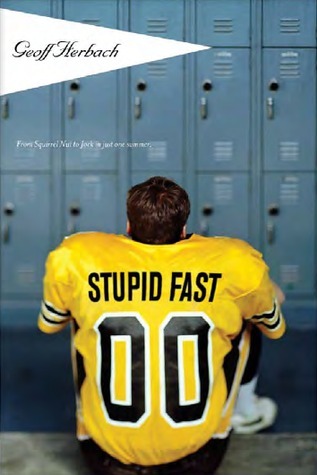 Stupid Fast is such a multi-faceted book too. On the surface are Felton's physical changes, that allow him to be brought into the world of football. His status as a "nobody" disappears, and all of the sudden he is faced with a much different set of social rules. However it's not only his social life that changes when this happens. Bring on the emotional parts of the book. As things start to get better in one aspect of his life, it becomes a struggle in the others. Watching Felton deal with his dysfunctional home life, with the dark secrets that are buried under his family, was really touching. I liked the fact that Geoff wasn't afraid to show that Felton isn't just a one dimensional guy. He, like all the rest of us, has to figure out what is most important in his life. I fully admit that I devoured this book in one complete sitting. The mixture of serious emotions, life changing discoveries, and all out humor, made Stupid Fast a book that I simply couldn't set down. My eyes were glued to the page people. Honest to goodness. I fell in love with Felton and his story, and I'm sure that you will too! I'd love to say more, but I'll leave it up to you to discover this fantastic character and story. Trust me, you need a copy.